The bright yellow spice called turmeric and its main active compound curcumin offer countless potential benefits, but there is one problem. There is very little bioavailability. In other words, your body can only absorb a very small amount after consuming it. The solution could be this: just combine black pepper and turmeric. Like turmeric, black pepper is an aromatic spice with lots of benefits, thanks to its major bioactive element piperine. And curcumin plus piperine may mean even greater benefits for your health than turmeric alone. Turmeric (Curcuma longa) is arguably the most powerful medicinal herb in the world at fighting disease, and it is backed by more than 10,000 peer-reviewed studies. However, it is the ancient principles of Ayurveda and traditional Chinese medicine (TCM) that have led modern science to document the benefits of herbs and spices such as turmeric. In Ayurveda and TCM, turmeric is a warming spice that first cools and dries the body in the short term. Chinese medicine doctors will also prescribe it for patients experiencing stagnation of “qi” and the blood, which is thought to cause conditions such as bleeding disorders, liver cirrhosis, an enlarged liver or spleen, and traumatic injury. Read on to learn more about why many experts believe black pepper and turmeric need to be combined. We will also explain the enhanced health benefits of turmeric and black pepper when you combine them. Like turmeric, black pepper (Piper nigrum) is full of potential health benefits, including aiding digestion, preventing cancer, and benefiting those with diabetes. And similarly to the way turmeric gets its benefits and yellow color from curcumin, black pepper owes its pungent flavor and health benefits to the natural compound piperine. Taking black pepper and turmeric together may increase the bioavailability of turmeric due to the incredible activity of curcumin plus piperine. Basically, piperine is able to enhance the absorption of turmeric, and therefore curcumin, since black pepper stimulates digestive enzymes and decreases inflammation linked with the quick breakdown of turmeric in the body. In one study published in the journal Planta Medica in 1998, researchers at St. John’s Medical College in Bangalore, India, found that two grams (g) of curcumin with just 20 milligrams (mg) of piperine had produced an amazing 2000% increase in bioavailability in human volunteers. In rats, the absorption of curcumin had also increased, by 154%. As a result, a low dose of curcumin, or turmeric, would have a greater effect when combined with piperine than a larger dose of curcumin or turmeric would alone. All it takes is a pinch of black pepper, or 1/20th of a teaspoon, to significantly boost the power of curcumin. That is why black pepper and turmeric are both found in common spice ingredients like curry powder. Both curcumin and piperine contain unique health properties on their own; however, when black pepper and turmeric are combined, the health benefits of turmeric are that much more enhanced. In this section, we will explore the health benefits of turmeric and black pepper when combined together. The combination of turmeric and black pepper for cancer is perhaps the most fascinating. Studies have demonstrated that black pepper with turmeric could inhibit the growth of cancerous stem cells in breast tumors. Turmeric also has been shown to have anti-cancer effects on leukemia cells, colon cancer cells, and gastric cancer cells. 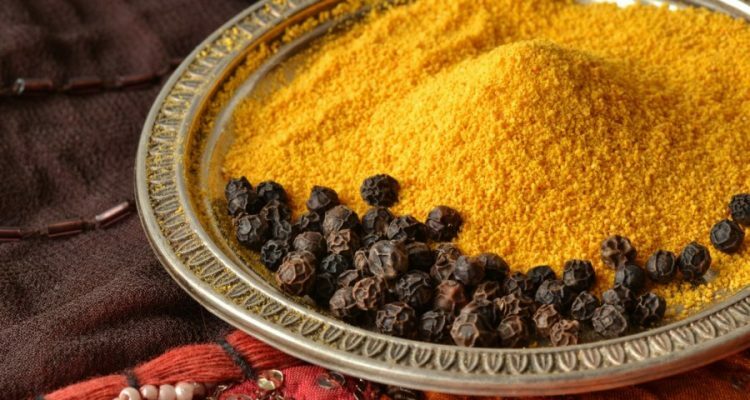 Moreover, researchers have found that spice extracts of black pepper and turmeric can be used to protect healthy tissue in those undergoing radiation therapy. Black pepper and turmeric may also be able to help with weight loss. One study published in the Annual Review of Nutrition in 2010 showed that curcumin will interact with liver cells, pancreatic cells, fats cells, muscle cells, and immune cells called macrophages. This could allow turmeric, with pepper, to fight several factors associated with obesity, including inflammation, hyperglycemia, hyperlipidemia, and insulin resistance. To help activate your metabolism, simply consume turmeric with black pepper and ginger in some water during the morning. Turmeric is reportedly great for liver detoxification. In the liver, turmeric is able to increase cholesterol elimination through boosting bile production. Curcumin is also known to protect against several toxins that can have a negative impact on the liver, including tobacco smoke, peroxide, galactosamine, and household chemicals. When combined with black pepper, turmeric may be able to boost the absorption of glutathione—a compound responsible for liver protection on a cellular level. In Ayurveda, turmeric has been used for digestive support for centuries. Research suggests that curcumin can help manage symptoms of ulcerative colitis and Crohn’s disease, such as gas, bloating, and abdominal pain. Black pepper and turmeric can both enhance the activity of digestive enzymes, therefore helping food process easier and more quickly. Black pepper and turmeric may together temporarily relieve joint discomfort, soreness, and stiffness. Turmeric is often used for joint pain, whereas piperine can desensitize a pain receptor called TRPV1. A study published in the Journal of Sports Science & Medicine in 2017 found that curcumin and piperine supplementation before and after exercise can reduce some aspects of muscle damage. This makes the combination of turmeric and black pepper great for athletes, and before and after a workout. Turmeric and black pepper for arthritis and inflammation is another great combination. The piperine in pepper is thought to be able to reduce the inflammation and pain associated with arthritis, while a number of a number of studies indicate that the curcuminoids in turmeric can prevent rheumatoid arthritis. One study from 2016 suggests that specialized formulation of curcumin can inhibit inflammation in the synovial fluid that lubricates joints. Another study from 2014 indicates that 1,500 mg daily of curcumin is as effective as the painkiller ibuprofen in the treatment of osteoarthritis. One study published in the journal Biochemistry and Biophysical Research Communications in 2009 found that curcumin is 400 times more potent than the common diabetes drug metformin when activating the enzyme AMPK (AMP-activated protein kinase). A compound called tetrahydrocurcumin, produced by curcumin fermentation, activates AMPK with up to 100,000 times the strength of metformin in particular cells. Turmeric can also improve glucose control and reduce insulin resistance. Research shows that black pepper and turmeric extracts work as potent antiglycation agents, and therefore have value in preventing glycation-associated complications in diabetes. Turmeric has natural antiseptic and antibacterial properties, which may make it ideal for wound healing and cleansing. A 2013 study published in the journal Expert Opinion on Investigational Drugs demonstrated that curcumin can control severe burn pain and improve burn wound healing. The pepper just makes the wound-healing ability of turmeric that much greater due to better absorption. What about black pepper and turmeric in the prevention of Alzheimer’s disease? Rat studies show that curcumin can reverse amyloid pathology associated with neurotoxicity, which is a key component in the progression of Alzheimer’s disease. Piperine makes curcumin more bioavailable; therefore, the turmeric is able to cross the blood-brain barrier, where it could benefit the brain and potentially prevent Alzheimer’s disease. A human study published in the journal Drugs R & D in 2008 found that curcumin was comparable to the lipid-lowering drug, atorvastatin, in reducing oxidative stress and inflammation in the treatment of high cholesterol. A 2014 meta-analysis also found that curcumin has no effect on blood cholesterol or triglycerides. The study authors noted that this is because of poor bioavailability of the curcumin formulations, and adding black pepper to the mix could possibly help with that problem. The curcumin in turmeric has anti-malarial properties, and has been tested for use against cerebral malaria. The piperine in the black pepper will only be able to increase the effectiveness of the curcumin, and therefore benefit the potential against malaria that much more. Adding turmeric root or powder with black pepper to your diet is the best way to obtain the health benefits of curcumin plus piperine. In addition to pepper, it is also beneficial to consume turmeric with healthy fats like coconut oil to enhance absorption. A golden turmeric paste with coconut oil, for example, can be used for smoothies, salad dressings, and curries. Curry powder contains both black pepper and turmeric, so it is a good idea to use the mixure when recipes call for it. Turmeric is great in eggs, soup, and certain rice dishes. You can also make tea that contains black pepper and turmeric. Although it can be delicious, making curry or using turmeric can be inconvenient on a regular basis. When this is the case, you should consider using a black pepper and turmeric supplement. Top quality brands will contain both black pepper and turmeric. When taking turmeric and black pepper supplements, start with small doses of a quarter-teaspoon to a half-teaspoon, and gradually increase that to a teaspoon two to three times daily for a few weeks. What about turmeric and black pepper recipes? I have two tasty treats for you below. In a saucepan, heat the almond milk and water. Place the tea leaves, turmeric, ginger, nutmeg, black peppercorns, cinnamon essential oil, orange essential oil, and cloves into the pan. Bring the mixture to a boil, reduce to low heat, and simmer. For a stronger taste, allow it to simmer longer. Strain the spices and pour into cups. Add the honey to taste. Add turmeric to the water in a pan. While you heat, gently stir until you get a thick paste. This can take six to 10 minutes. If the paste is watery, add more turmeric. If it has become too thick, add more water. Add the black pepper and coconut oil when you have achieved your desired thickness. Keep stirring to ensure all ingredients are mixed properly. Allow it to cool. Keep the paste in a jar, and refrigerate for up to one to two weeks. The health benefits of turmeric and black pepper are well documented, and together they may be able to treat cancer, digestive issues, weight problems, inflammation and arthritis, diabetes, Alzheimer’s disease, high cholesterol, and malaria. However, there are turmeric and black pepper side effects to consider. Some people have reported allergic reactions to turmeric, which is often experienced as a mild rash. High doses of turmeric have been observed to cause diarrhea, nausea, increased bleeding, low blood pressure, hyperactive gallbladder contractions, increased menstrual flow, and uterine contractions in pregnant women. As a result, it is recommended to avoid turmeric supplements when experiencing bleeding disorders, or if you take antiplatelet medications. Turmeric may also interfere with anti-coagulants like warfarin, aspirin, and clopidogrel. Also, limit your turmeric intake in cases of gallbladder stones, and avoid taking it on an empty stomach or when pregnant or breastfeeding. Jager, R., et al., “Comparative absorption of curcumin formulations,” BMC Nutrition Journal, Jan. 2014; 13:11, doi: 10.1186/1475-2891-13-11. Srinivasan, K., “Black Pepper and its Pungent Principle-Piperine: A Review of Diverse Physiological Effects,” Critical Reviews in Food Science and Nutrition, Nov. 6, 2007, 47(8):735-48 47(8); doi: 10.108010408390601062054. Shoba, G., et al., “Influence of piperine on the pharmacokinetics of curcumin in animals and human volunteers,” Planta Medica, May 1998; 64(4): 353-356, doi: 10.1055/s-2006-957450. “Common spices Protect Bacteria During Irradiation,” Science Daily, May 8, 2000; https://www.sciencedaily.com/releases/2000/05/000508083050.htm, last accessed April 5, 2018. Aggarwal, B.B., “Targeting inflammation-induced obesity and metabolic diseases by curcumin and other nutraceuticals,” Annual Review of Nutrition, Aug. 21, 2010; 30: 173-199, doi: 10.1146/annurev.nutr.012809.104755. Delecroix, B., et al., “Curcumin and Piperine Supplementation and Recovery Following Exercise Induced Muscle Damage: A Randomized Controlled Trial,” Journal of Sports Science & Medicine, March 2017; 16(1): 147-153, PMID: 28344463. Funk, J.L., et al., “Turmeric extracts containing curcuminoids prevent experimental rheumatoid arthritis,” Journal of Natural Products, March 2006; 69(3): 351-355, doi: 10.1021/np050327j. Kloesch, B., et al., “In Vitro Study of a Liposomal Curcumin Formulation (Lipocurc): Toxicity and Biological Activity in Synovial Fibroblasts and Macrophages,” In Vivo, July to Aug. 2016; 30(4): 413-419, PMID: 27381602. Kuptniratsaikul, V., et al., “Efficacy and safety of Curcuma domestica extracts compared with ibuprofen in patients with knee osteoarthritis: a multicenter study,” Clinical Interventions in Aging, March 2014; 9: 451-458, doi: 10.2147/CIA.S58535. Kim, T., et al., “Curcumin activates AMPK and suppresses gluconeogenic gene expression in hepatoma cells,” Biochemical and Biophysical Research Communications, Oct. 2009; 388(2): 377-382, doi: 10.1016/j.bbrc.2009.08.018. Naderi, G.H., et al., “Effect of some high consumption spices on hemoglobin glycation,” Indian Journal of Pharmaceutical Sciences, Nov. to Dec. 2014; 76(6): 553-557, PMCID: PMC4293689. Cheppudira, B., et al., “Curcumin: a novel therapeutic for burn pain and wound healing,” Expert Opinion on Investigational Drugs, Oct. 2013; 22(10): 1295-1303, doi: 10.1517/1354784.2013.825249. Usharani, P., et al., “Effect of NCB-02, atorvastatin and placebo on endothelial function, oxidative stress and inflammatory markers in patients with type 2 diabetes mellitus: a randomized, parallel-group, placebo-controlled, 8-week study,” Drugs R & D, 2008; 9(4): 243-250, PMID: 18588355.